This was me. 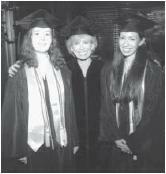 That's Dr. Laura between the two graduates (the photo is bad because I got it from my college website). Dr. Laura was my graduation speaker. Her speech was (surprisingly?) shallow. It was something like "Top Ten Stupid Things Graduates Do to Mess Up Their Lives." I don't know anybody who was impressed after she actually opened her mouth. I mean, the woman spends her life giving people verbal lashings; not a lot of positive wisdom there, eh? The stupid things we were to avoid were things like not working or expecting to have a top-level job right when we graduate. It was more common sense than inspiring. This time, my graduation speaker is Os Guinness. Not only is he an author whose books I have read and enjoyed, he also tells us in one of his books that he is the great-great-great (or something like that) grandson of the founder of Guinness beer. Now what good Presbyterian will complain about that combination? I guess I shouldn't complain about the photo op with Dr. Laura. My Hillsdale education did provide me with a few of those ... which is nice. And good for the ego. Speaking of which, I'm glad that Westminster doesn't do any ego-boosting awards for grades, etc. It seems like that would contradict the kind of mentality that we want to inculcate in ministers of the Gospel. The other day I saw an ad for a 'who's who of seminary students' thing. It's just like high school - pay your $30 and you get your name in a book. I wanted to spray-paint across the campus: "DON'T do this!!!" Again, to do something like that - simply for the 'name-in-the-book' status seems so contrary to how we should strive to be. I know we've all get that pride in us; but the least we can do is try not to feed the monster any more than we already do! I forgot what you looked like with long hair. Actually WTS does do an ego-boosting award: the E.J. Young award. Or at least they used to do it until last year, when they ran out of money.